The prospect of Manchester’s Millyard turning into a global hub for manufacturing human organs&comma; as well as the millions of federal and private sector dollars flowing into the Advanced Regenerative Manufacturing Institute (ARMI) to accomplish that&comma; has many leaders in NH betting that the biotech and biomed industry will become the next major economic engine for the state. 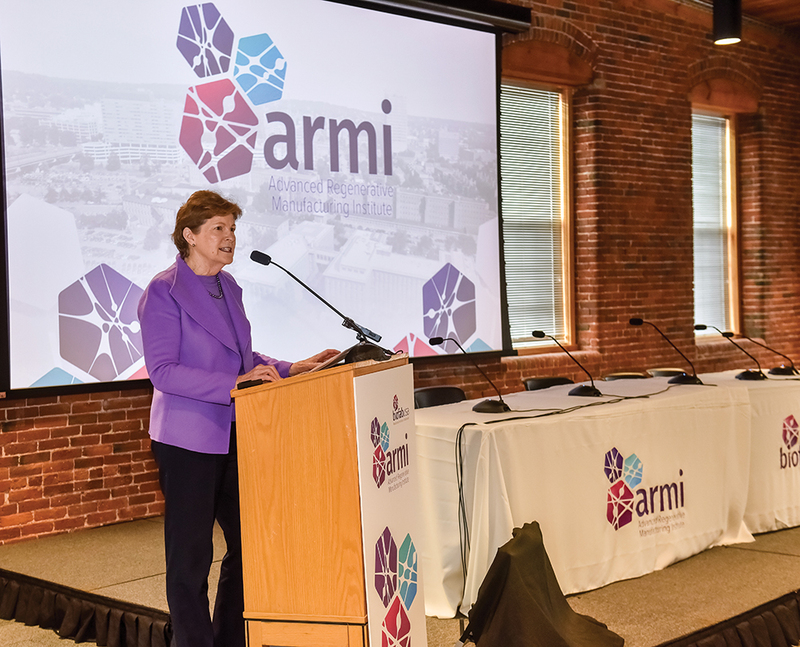 ARMI is a nonprofit designed to attract and develop an ecosystem of companies and academic and medical nonprofit partners to develop the regenerative manufacturing industry. ARMI is based at the Technology Center at 400 Commercial St. in Manchester. State legislators bucked a long-standing tradition of not offering tax incentives by approving a bill earlier this year granting a business tax holiday for regenerative manufacturing companies until 2027. The legislature also appropriated $5 million for a regenerative manufacturing workforce development program. The program will forgive student loans for graduates employed in the regenerative manufacturing industry in NH for five years. 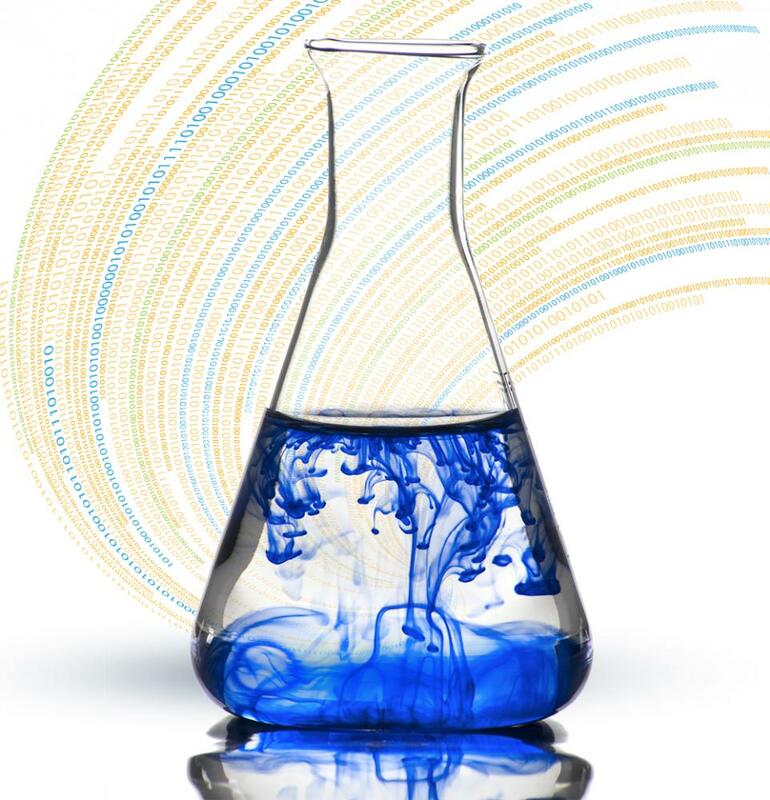 NH EPSCoR (Established Program to Stimulate Competitive Research)&comma; the organization that directs federal investments in scientific research&comma; was recently awarded a $20 million National Science Foundation grant. That money will fund NH BioMade&comma; an initiative to advance the design and manufacture of biomaterials. “ARMI has been a catalyst for breathing new life into the Biotech Cluster&comma;” says Cindy Conde&comma; a biotech manufacturing veteran and chair of the BioTech/MedTech Cluster. And while the ARMI project has renewed economic interest in NH’s biotech/biomed sector&comma; this sector has been thriving in NH for years. It ranges from homegrown firms such as Adimab&comma; an antibody discovery company in Lebanon&comma; to global companies such as Lonza Biologics&comma; a pharmaceutical company that employs 1&comma;000 in Portsmouth. Other recent initiatives to support the state’s growing biotech industry include the Hannah Grimes Center for Entrepreneurship in Keene&comma; which launched a rural biotech incubator. Dubbed BiO NeSTe&comma; the incubator now hosts Lash Laboratory Solutions&comma; which tests agricultural products&comma; including unpasteurized milk. There are more than 200 companies involved in NH’s biotech/biomed sector&comma; Conde estimates&comma; but adds&comma; “We’re still trying to figure out how big it is.” She says the NH Tech Alliance defines the sector broadly to include pharmaceutical companies&comma; medical device manufacturers&comma; research firms and support services. It’s a sector that is growing and in need of talent. A recent search for biotech jobs in NH on Indeed.com yielded 90 results&comma; including a microbiologist at Novo Nordisk in West Lebanon&comma; a senior manufacturing operator for EMD in Jaffrey&comma; and a lab equipment repair technician for Marshall Scientific in Hampton. Herve Berdou&comma; site head at Lonza&comma; says the expansion is in preliminary stages and declined to talk about specifics regarding new jobs. “We have been present in New Hampshire for 20 years. We need to make sure we can scale from a volume and technology aspect&comma;” he says. Berdou adds that Lonza is building bioreactors at Pease&comma; saying&comma; “Basically&comma; we are building the next generation of biologics in New Hampshire.” The project is expected to be completed by 2020. In addition to Lonza&comma; NH is also home to other global biotech companies such as MilliporeSigma in Jaffrey&comma; Medtronic in Portsmouth and Novo Nordisk. Novo Nordisk&comma; a Denmark-based company&comma; produces hemophilia and growth hormone therapy products at the West Lebanon facility&comma; which it acquired in 2014. The site has been a hub for biotech manufacturing over the years and it was previously owned and operated by Stryker Biotech and Olympus to manufacture technology for skeletal repair. The state’s diverse biotech ecosystem also includes support companies such as Helix Design&comma; a product development firm in Manchester&comma; which partnered with one of its clients&comma; iRADIMED Corp.&comma; to design a remote station that allows “continuous patient monitoring before&comma; during and after MRI scans.” Another is Sunrise Labs&comma; a medical device developer in Bedford with more than 65 engineers. New Hampshire’s biotech sector also includes manufacturers such as Resonetics in Nashua&comma; which produces components for life science devices. The firm acquired two companies this year. There’s also Vapotherm in Exeter&comma; a developer and manufacturer of advanced respiratory care technology&comma; which was named MedTech Company of the Year in May by the New England Venture Capital Association. Yet another growing biotech company is LSNE Contract Manufacturing in Bedford&comma; which provides contract lyophilization (or freeze drying) services to the pharmaceutical&comma; biotech and medical device industries. 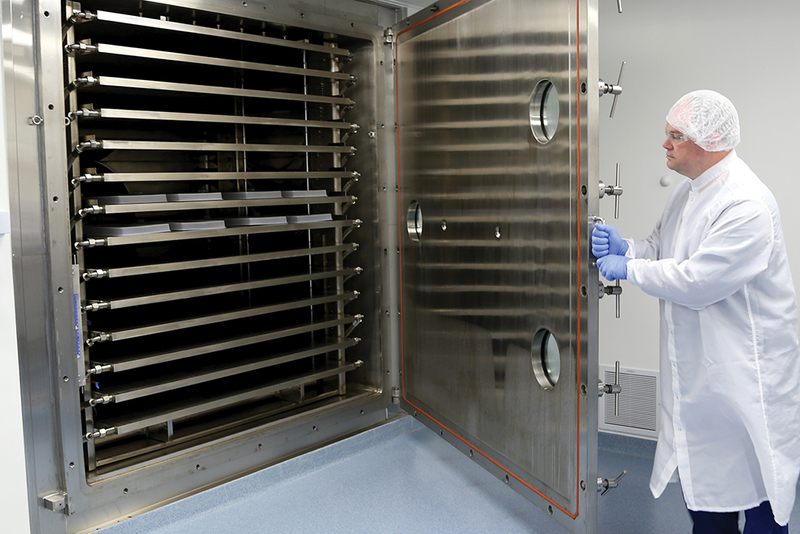 In April&comma; LSNE acquired a Wisconsin firm to add capacity to manufacture final drug products. LSNE Contract Manufacturing in Bedford provides contract lyophilization services. Courtesy photo. LSNE also expanded its quality control lab and warehouse by 38&comma;000 square feet. The company&comma; which has 236 employees across four facilities (three in NH)&comma; has added about 20 full-time positions this year. “We have close to 24 open positions&comma;” says COO Shawn Cain&comma; who&comma; for the first time&comma; is looking for talent out of state. Matthew Halvorsen&comma; LSNE founder and president&comma; says being close to a biotech hub like Boston helps in finding talent. It’s been quite a trajectory for the company&comma; which started with a $50&comma;000 SBA loan in 1997. In 2017&comma; it was acquired by Permira Funds&comma; a private equity firm&comma; to accelerate LSNE’s growth plans. (Halvorsen maintains a significant equity stake.) “By the end of next year&comma; we’ll be over $100 million in revenue. It’s been a great story&comma;” Halvorsen says. 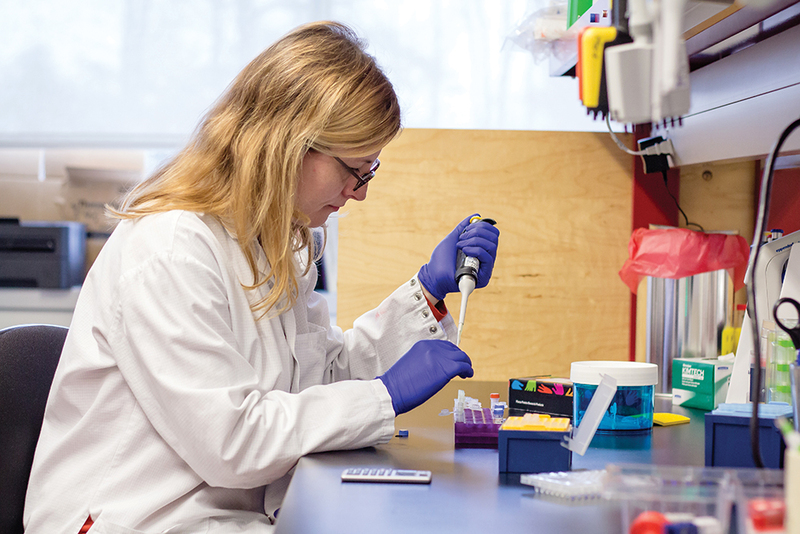 Innovative biotech companies in NH are often snapped up by larger corporations. Tillman Gerngross&comma; who cofounded Adimab (which has attracted millions in venture funding&comma; including from Google)&comma; previously launched GlycoFi&comma; which was also based in the Upper Valley. GlycoFi developed a yeast-based technology used to manufacture drugs and sold to Merck in 2006 for $400 million. Medarex&comma; a biopharmaceutical firm that developed antibody-based cancer therapies&comma; was started by three scientists from Dartmouth Medical School in 1987. After moving out of state&comma; it was acquired by Bristol-Meyers Squibb in 2009. One of its founders&comma; Michael Fanger&comma; also cofounded Celdara Medical in Lebanon&comma; which drives early stage discoveries at colleges and universities into medical clinics. Celdara is the fastest growing company on this year’s list of NH’s Top 100 Private Companies. The firm partners with academic researchers to bring new medicines and therapies to market. Celdara helps to bring new cancer therapies to market. Courtesy photo. CEO Jake Reder says being close to a biotech hub like Boston is an advantage&comma; not only for attracting talent to NH&comma; but also for tapping into venture capital and industry expertise. And while Cambridge may have one of the highest concentrations of biotech companies worldwide&comma; Reder says NH has been able to create its own biotech ecosystem&comma; fueled by activity at Dartmouth College and now ARMI. Celdara is doing its part to help grow that ecosystem. In September&comma; the company received a three-year&comma; $3.5 million award from the National Institutes of Health to support an “Institutional Development Award Center of Biomedical Research Excellence.” Celdara will create and operate a Regional Technology Transfer Accelerator Hub for the Northeast&comma; serving Delaware&comma; Rhode Island&comma; Vermont&comma; Maine and NH. The Hub will collaborate with 10 research institutions in those states&comma; including Dartmouth College and the University of NH&comma; as well as three other Hubs in central&comma; southeast&comma; and western regions of the U.S.
“We have people identified and funded in these 10 institutions. We will curate the best resources for entrepreneurs and engage students and faculty&comma;” Reder says. The Hub will take promising discoveries to potential investors and partners to bring a variety of biotech and medtech to market&comma; he says. Celdara is mapping out the available resources among the institutions. Simbex&comma; a medical device and consumer health product design and development firm in Lebanon&comma; serves on the advisory committee for the new center and will be assisting those bringing devices to market while Celdara will advise those working on therapeutic discoveries&comma; Reder says. The biotech endeavor capturing headlines&comma; though&comma; is ARMI. Its goal is to develop and support the large-scale manufacturing and commercialization of engineered tissues&comma; organs and tissue-related technologies by bringing together engineering&comma; life science&comma; computer science&comma; materials science&comma; manufacturing and workforce development experts. In December 2016&comma; the Department of Defense (DOD) awarded $80 million to ARMI&comma; which has also attracted $214 million from a consortium of companies&comma; government entities&comma; universities&comma; community colleges&comma; and nonprofit organizations. A proposal by Dean Kamen&comma; inventor of the Segway and founder of DEKA Research and Development Corp. in Manchester&comma; won the DOD’s ARMI contract&comma; beating out 59 other proposals; this landed the project in NH. While the technology is advancing&comma; it will take a decade or two to grow human organs. Sen. Jeanne Shaheen speaking at the 2018 ARMI Winter Summit. Courtesy of ARMI. Kamen’s involvement in ARMI led to Maritine Rothblatt&comma; chair and CEO of United Therapeutics&comma; to relocate a subsidiary&comma; Lung Biotechnology PBC&comma; to Manchester along with $1 million worth of lab equipment and six researchers. 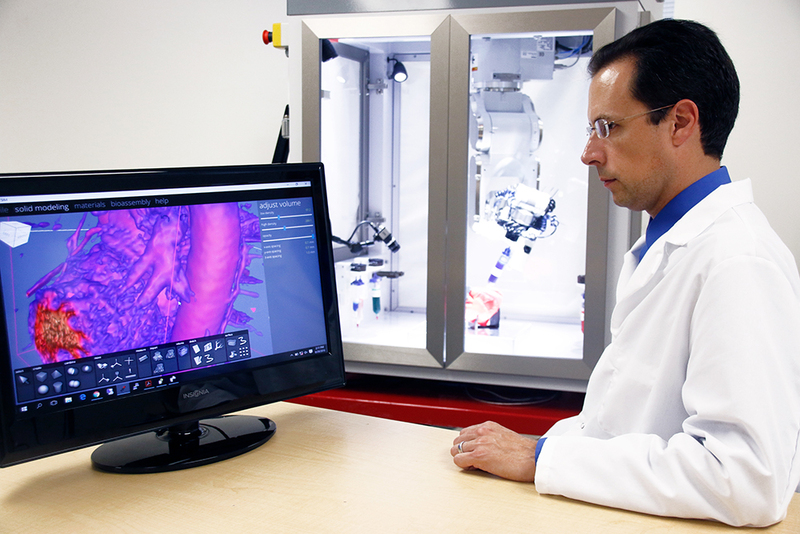 Advanced Solutions Life Sciences in Kentucky&comma; which makes 3-D printing technology&comma; moved operations to Manchester to eventually be able to build tissues and organs as part of the ARMI effort. Advanced Solutions Life Sciences&comma; based in Kentucky&comma; is developing the technology to eventually build human tissue. It has a location in Manchester. Courtesy photo. Taylor Caswell&comma; commissioner of the NH Department of Business and Economic Affairs&comma; says the biotech/biomed sector is one of the fastest growing sectors of the state with ties to health care&comma; one of the largest sectors of the NH economy. “When you bring in the ARMI component&comma; it pours gas on the fire&comma;” Caswell says. Kamen says while it will take years for ARMI to realize its vision&comma; it is moving in the right direction. “It’s important we succeed for the country&comma; for people waiting for organs and for the state economy&comma;” he says.